Sense-resisting parables full of deranged twists and dizzying embellishments. 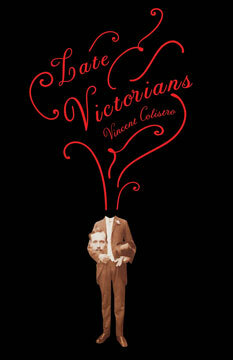 “I was only born into the world,” begins one of Vincent Colistro’s poems, “didn’t invade it, didn’t ransom it for a nicer one.” The Late Victorians, Colistro’s debut, is a beguilingly irreverent investigation of the life he was “born into.” Hyper-fluent, riding wave after wave of copious invention, Colistro builds his weirdness from scratch, turning simple ideas into sense-resisting parables full of deranged twists and dizzying embellishments. (“We Rick-rolled, we raised / pre-flop, we flapped our pool noodles / at each other’s caboose.”) Wily, witty and packed with brilliant sleights of hand, The Late Victorians announces an original talent. [Colistro’s] ornate phrasings and original imagery force us into awe. –Jeramy Dodds, Short Grain contest judge’s comment. Vincent Colistro poems have appeared in The Walrus, Hazlitt, Geist and Arc. He was a prize-winner in the 2012 Short Grain contest, and was nominated for National Magazine Award for Poetry in 2014. He lives in Toronto. 88 pp 8.5" x 5.5"